KUNSTrePUBLIK is a registered non-profit organization and artist collective founded in 2006. The group’s formation was precipitated by their initial project, Skulpturenpark Berlin_Zentrum, a non-traditional exhibition venue on 62 vacant lots of downtown real estate, on what was formerly the “death strip” within the Berlin Wall. Since 2006, the group has conceived and realized many site-specific exhibitions, which have pulled from their extensive research of the site’s history and its present in-between status. As part of e.city – Berlin, Apollonia will present their last project, an imposing installation VVest Life. 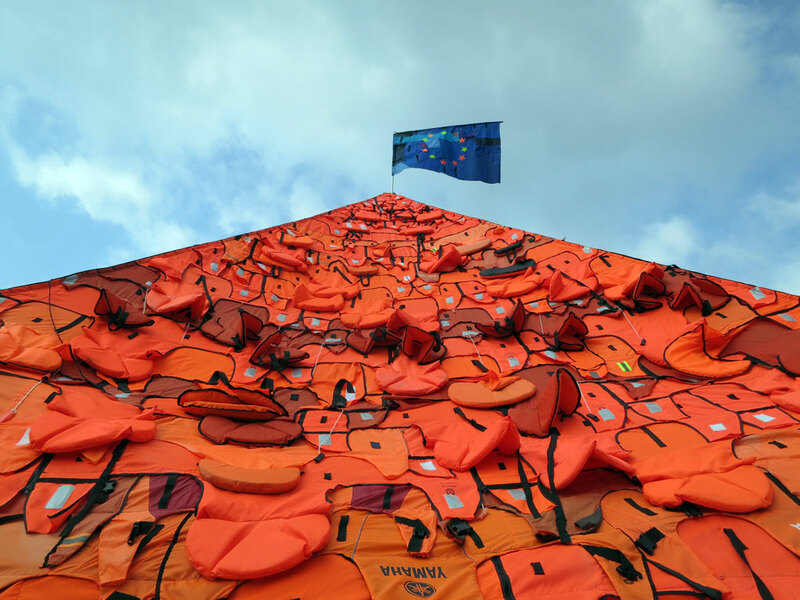 Just steps from the European institutions, in contrast to their solemn aspect, an alternative parliament will rise, built from the most prominent object and symbol of migration over water: the life vest. This parliament – referencing to the shape of the EU flag – is a movable platform open for citizens, refugees, politicians, activists and all those willing to comment constructively on the current situation in Europe. The artists will ask the crucial questions: Is Europe in a crisis of values? How can we practise solidarity? Who can participate? How can we approach inclusion, integration and mutual learning? Opening on 3rd of March 2017 at 6:30 p.m.